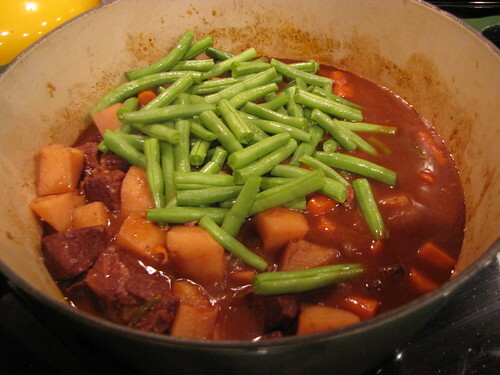 Beef Stew with Potatoes & Green Beans is one of those One Pot Wonder Meals. 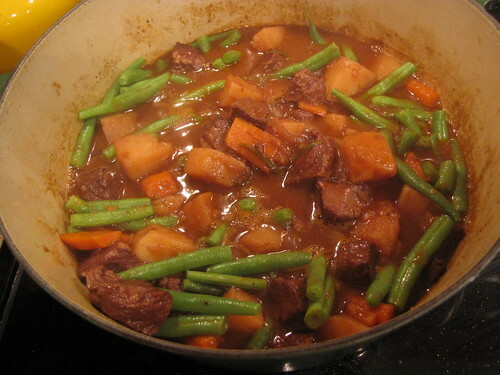 You have tender pieces of beef braised in wine, savory hearty veggies like carrots, onions, and potatoes, and crazy crisp green beans all in one pot. 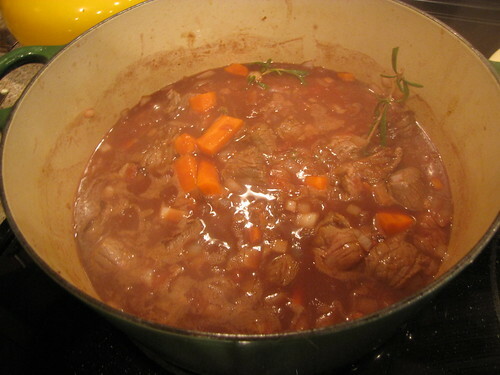 I got this recipe from my friend Derry (it’s originally from Dave Lieberman/Food Network) who also gave me the recipe for Carbonnade – a beef stew made with Belgian ale. Derry also happens to have a giant black cat named Paco who could easily pass as my cat Gus’ twin. Like any good stew, this takes a couple of hours to cook but the actual preparation is quick and easy to put together. 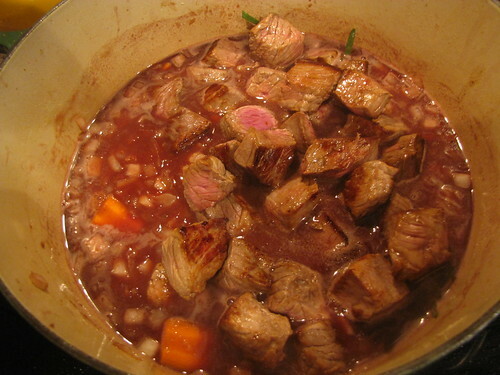 Once it’s all in the pot, sit back, relax and wait for the amazing smells of beef and wine goodness to take over. Beef*, Onion, Carrots, Potatoes, Green Beans, Rosemary, Beef Broth, Red Wine, Olive Oil, Flour, Butter, Crushed Tomatoes, Salt & Pepper. 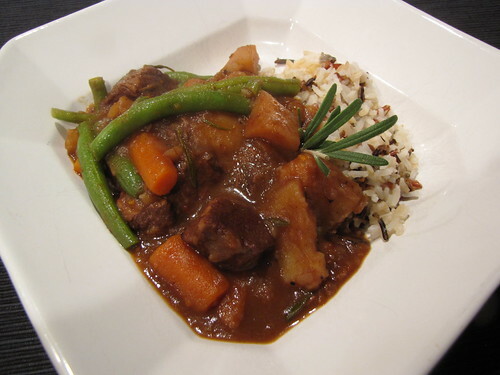 *I am not a fan of “stew meat” as it is found in the grocery store. It’s not always a great cut of meat, usually has a lot of fat and gristle, and you’re paying for someone else to cut it up. 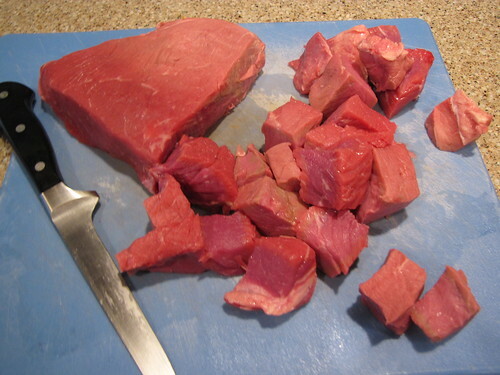 Instead, I like to buy a nice middle of the road cut of meat such as top round and cut it into chunks myself. I have about 2 pounds of beef. 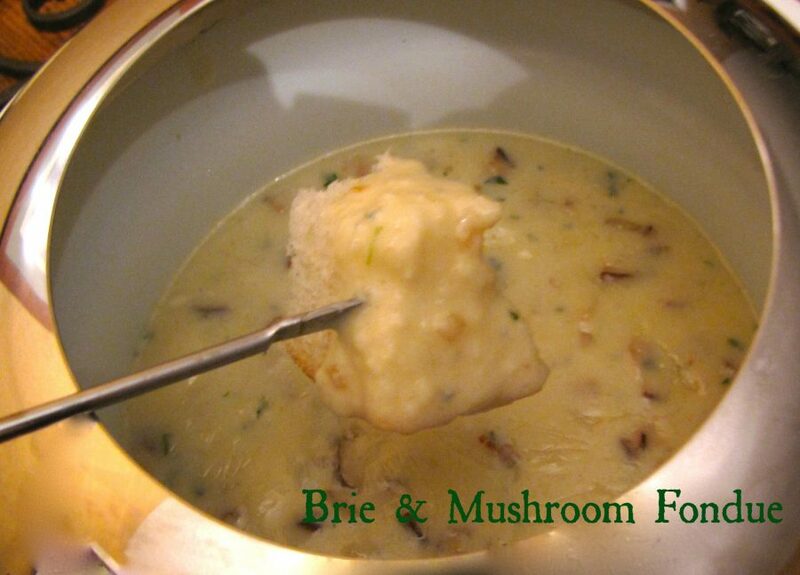 Heat 1 Tablespoon of olive oil and 1 Tablespoon of butter in a large pan or dutch oven. I like to use the oil/butter combo because it lets you use a higher heat to brown the meat without burning the butter. 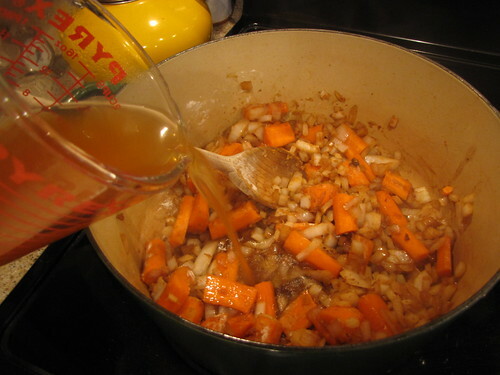 I also start with a little less oil/butter and add more as I go if the pan is looking dry. I used 3-4 Tablespoons total of oil and butter combined. Brown the chunks of meat over medium high heat. 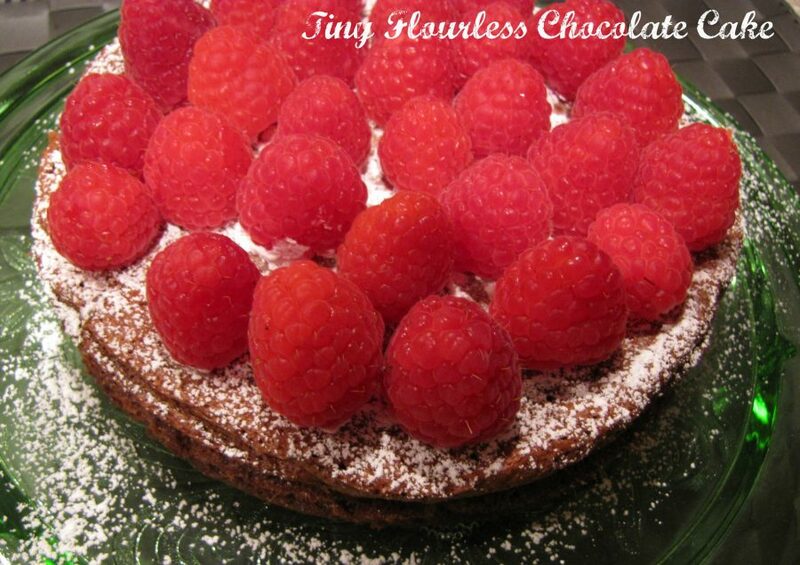 Be sure to work in small batches for better and more even browning so that the pan is not crowded. If the meat is browning too quickly, turn the heat down to medium. No need to cook the meat all the way through. Just get a nice brown crust on both sides. 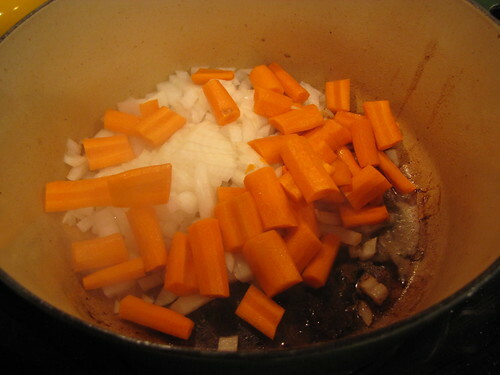 While the meat browns, chop up one large onion and peel and cut 4 carrots into 1 inch chunks. When all the meat has browned, remove it from the pan and add 1 more Tablespoon each of butter and olive oil. Add the chopped onion and carrot chunks to the pan and sauté for 5 minutes until tender but not too browned. If the bottom of your pan is gettting too dark, turn the heat down to medium so the veggies don’t burn. 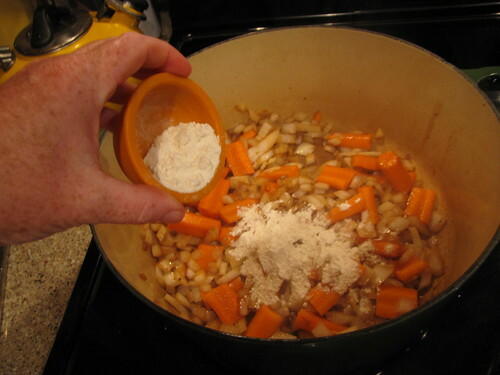 When the carrots and onion are tender, stir in 2 Tablespoons of flour to make a thickener or roux. 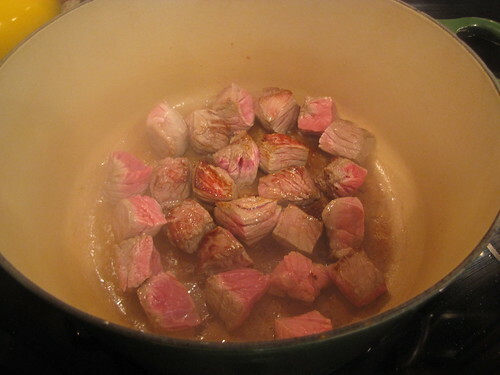 Pour in 2 cups of beef broth and stir to gently scrape up the browned bits from the bottom of the pan. 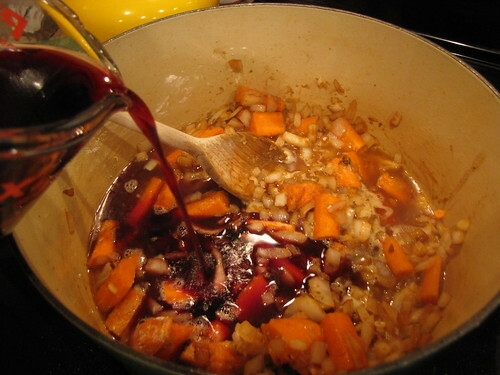 Add 2 cups of fully bodied red wine such as cabernet, shiraz, or merlot. Add a few sprigs of fresh rosemary. No need to take them off the stem, just toss them right in the pot. 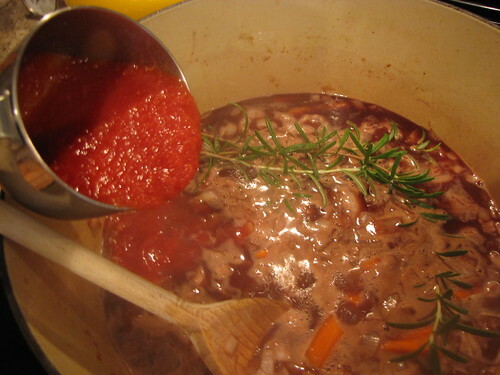 Add some more flavor with 1 cup of canned crushed tomatoes. Season with salt & pepper. 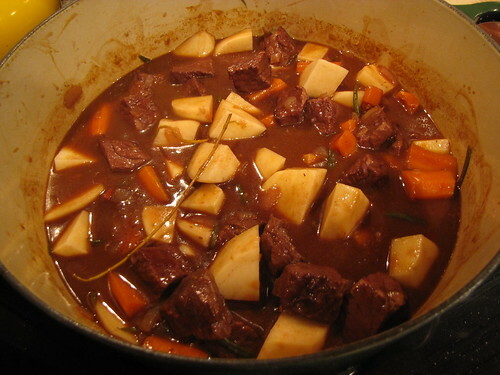 Put the meat and any accumulated juices back into the pot and bring the stew to a boil. Turn the heat down to low, cover with a lid, and simmer gently for 45 minutes. Check in on the stew, stirring occasionally to scrape up any tasty bits from the bottom of the pan. After 45 minutes, you can see that the broth has turned a rich, reddish brown. You can also see that the rosemary has fallen off the stems so go ahead and pick them out of the pot. Add 3 large potatoes that have been peeled and cut into chunks. 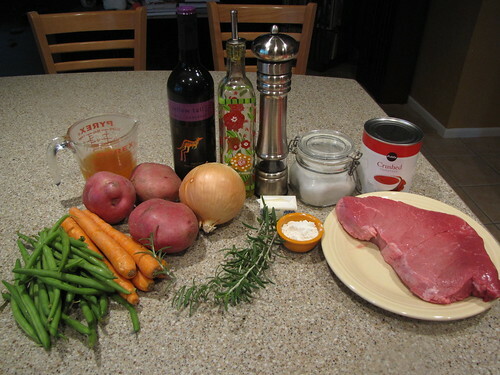 Stir them into the stew, return the pot to simmering if necessary, cover and cook for an additional 30-45 minutes until the potatoes and beef are both fork tender. To me the best and most interesting part of this dish was the green beans. Wash and trim about 1/2 pound of fresh green beans and cut them into 2 inch pieces. Add the green beans to the cooked stew and cook for 5-10 minutes until the beans are tender, bright green, and still quite crisp. 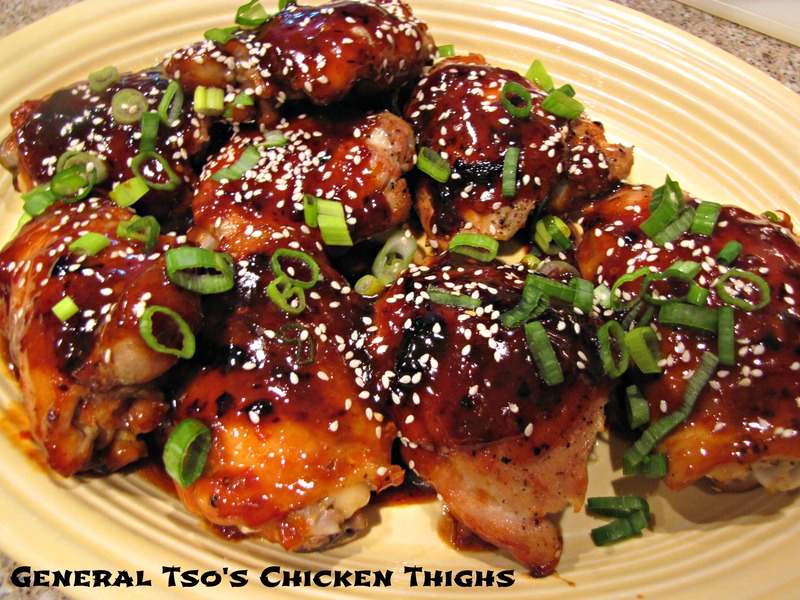 Double check the seasonings and add salt & pepper to taste. I served this with a bit of rice, but you don’t really need it as the potatoes and beef are hearty enough on their own. Having the crisp beans with the soft carrots and potatoes is quite a nice change of pace for stew and gives a burst of fresh flavor to one of the ultimate comfort foods. This looks … WONDERFUL ! 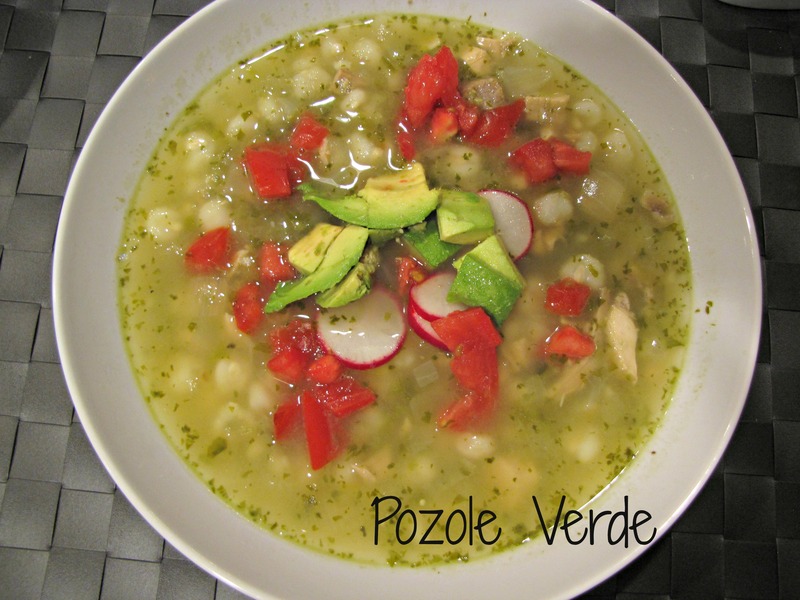 I love stew : easy to cook and delicious to eat. Your crude meat seems to be a very good quality and the final result makes me hungry … I just left table ! This is a lovely combination of good stuff. I love that you added in crushed tomatoes; I’ve never thought of that. I made a slow cooker meal with beef, carrots, ‘shrooms and taters today. Next time, I will try your version.